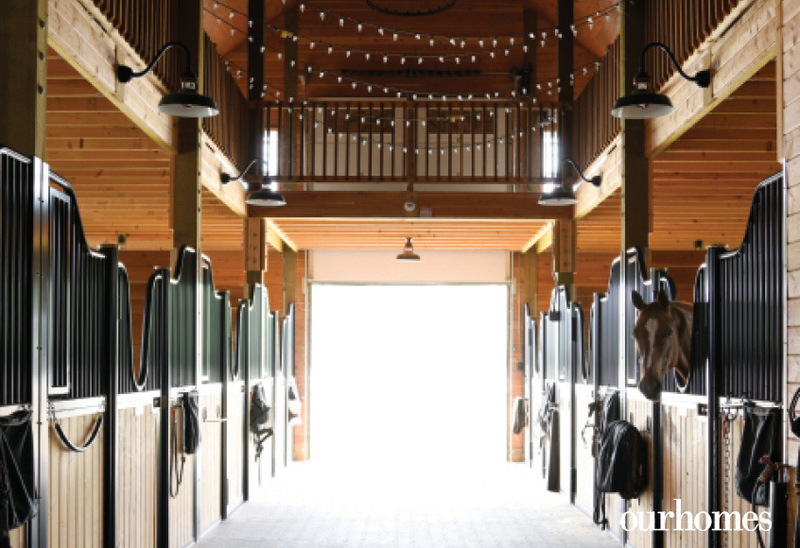 An Ottawa equestrian estate gets the jump on creative design. 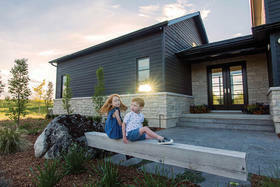 A version of this article originally appeared in the Fall 2018 issue of OUR HOMES The City of Ottawa, p.72. Find local businesses in our Ottawa directory. 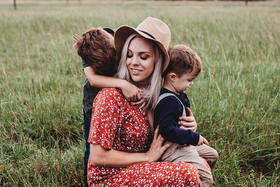 After picking up a 25-acre parcel of land in the Osgoode area, and soon after the adjoining 25 acres, Leigh Currie of Urban Design Company designed and created an equestrian estate for her family. A series of barns, outbuildings, sand rings and paddocks now accompany the fully-landscaped 5,000 sq. ft. home that’s the centrepiece of the estate. 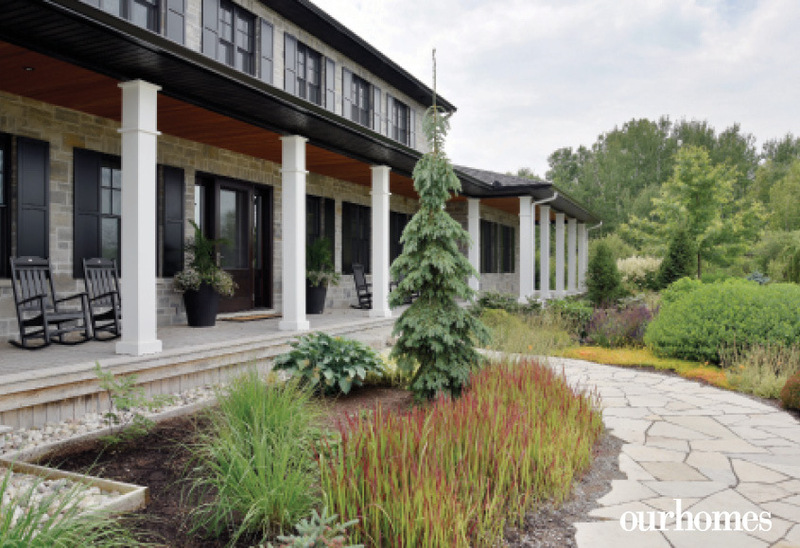 Lush landscaping leads to an oversize solid walnut front door that reveals a spacious foyer. 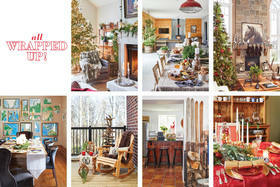 Leigh designed the door herself, which was crafted by Amberwood Doors Inc. Inside, with an upscale yet welcoming ambience, the home contains six bedrooms and four-and-a-half baths. An open concept was an important design consideration. 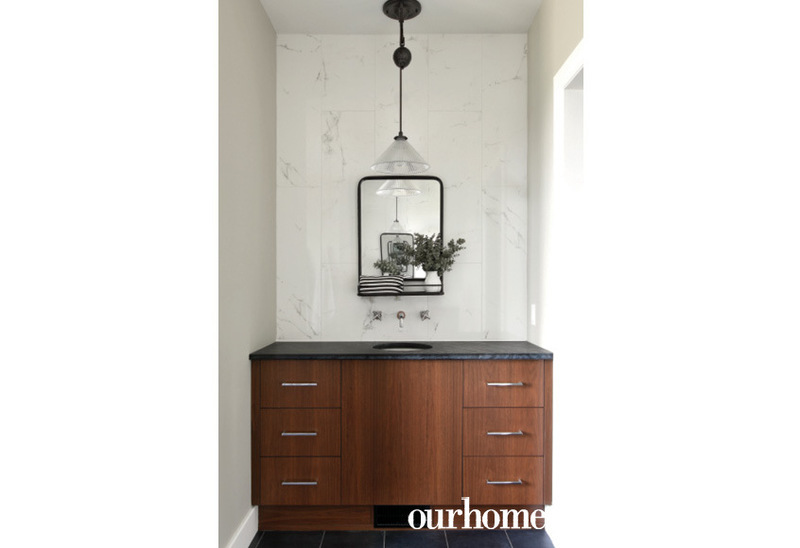 In the kitchen, she started off with an oversize Calacatta marble slab on the island. 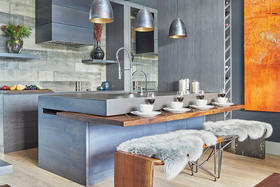 Crowned by a black and stainless hood vent, a Wolf dual oven range holds centre court amid the Caesarstone countertop running the perimeter of this area. 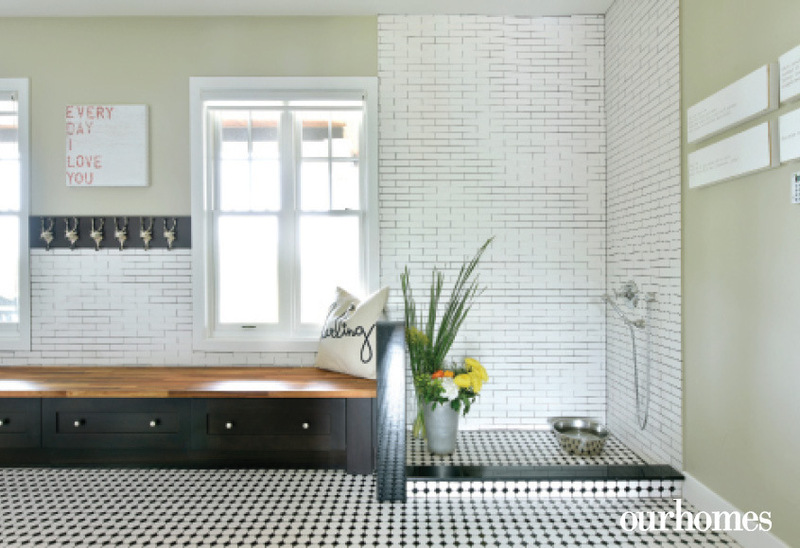 A large mudroom with perimeter bench seating and a ceramic tiled dog shower (all tile throughout the home is by Dominic Flynn of Urban Design Company). The only exception can be found in the form of an equestrian print, upstairs in the master bedroom where a sanctuary has been created for Leigh and Dominic. 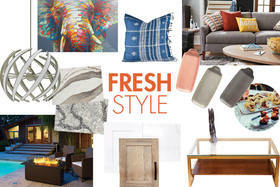 Spacious, light-filled from the many windows and dressed in calm and neutral colours, it’s the perfect getaway. Bordered by lush landscaping, a flagstone walkway leads to the wide front porch of this 5,000 sq. 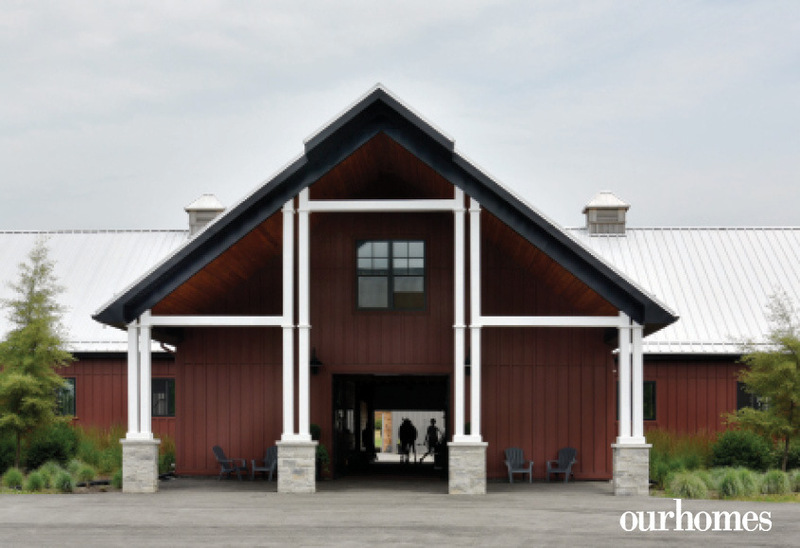 ft. home, the centrepiece of a 50-plus acre equestrian estate in Osgoode. A large deck for entertaining transitions to the in-ground pool area. 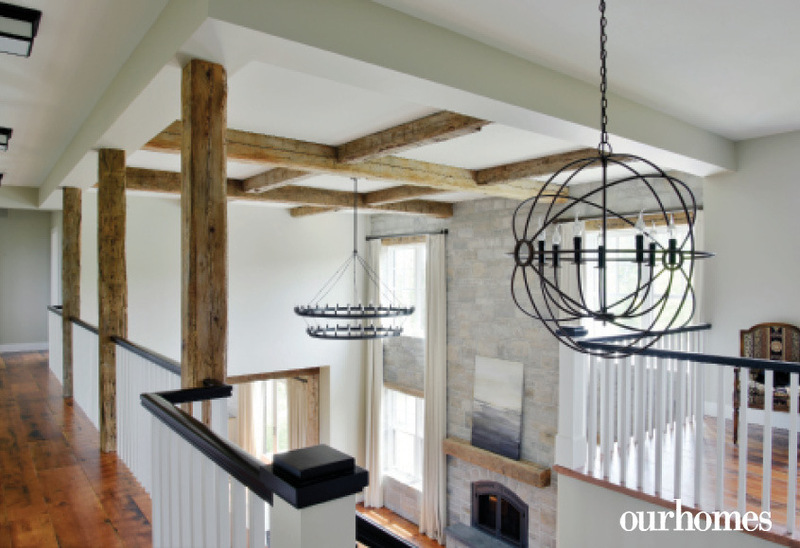 The homeowner designed every last detail, including this barn. Tate peeks out of his stall, one of 11 stalls in the main barn. 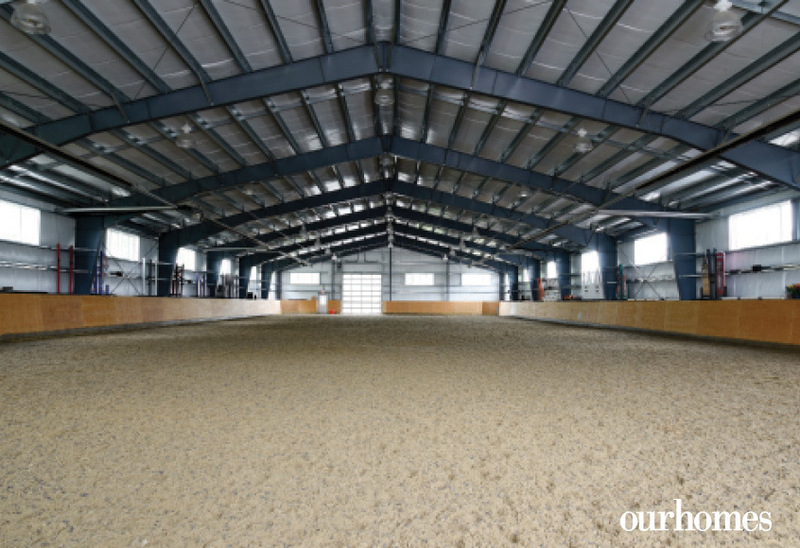 The property also includes an indoor 80-by-200 foot laser-levelled arena. 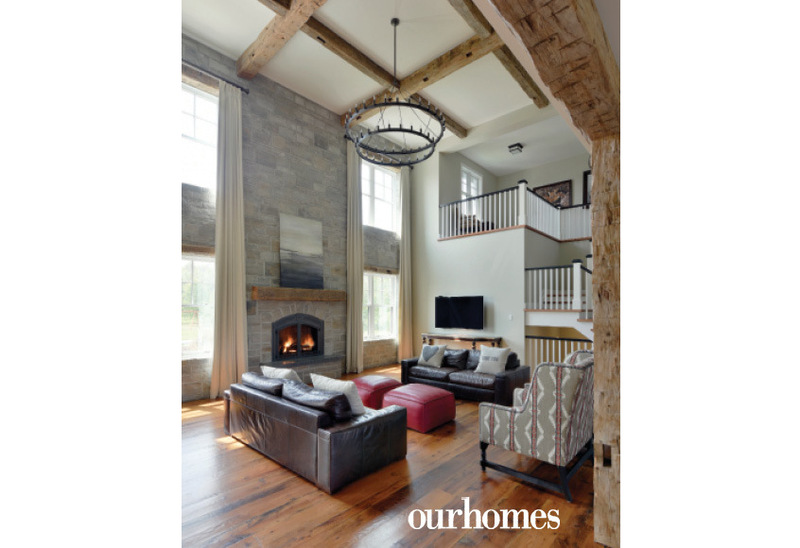 A two-storey great room has weathered beams and a wheel-spoke pendant light. A stone feature wall surrounds a full height fireplace. The room is open to above, where a catwalk runs the perimeter, leading off to the bedrooms. 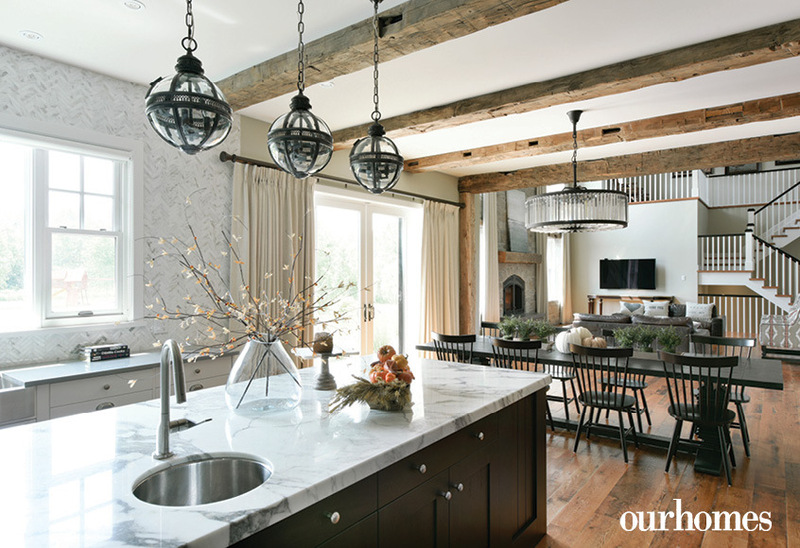 The kitchen-dining space was designed by the homeowner as a gathering place for her family as well as to host large gatherings during the holidays. 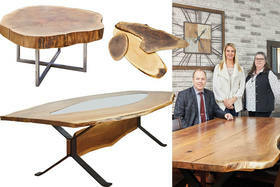 The 10-foot table can be extended with two additional leaves and can easily seat 14 people comfortably. At the heart of the kitchen is an oversized island with Calacatta marble top. There’s also Bosch integrated dual dishwashers, a Sub-Zero full-size fridge as well as a Sub-Zero full-size freezer, while the pantry, tucked around the corner, holds an additional Wolf wall oven (bringing the total to three), a Wolf microwave and a GE Monogram fridge-freezer combo. 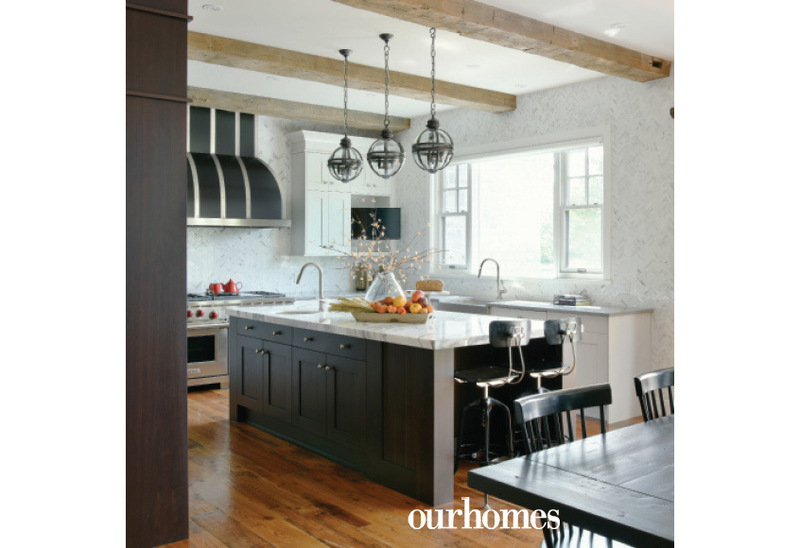 At the heart of the kitchen is an oversized island with Calacatta marble top. There’s also Bosch integrated dual dishwashers, a Sub-Zero full-size fridge as well as a Sub-Zero full-size freezer, while the pantry, tucked around the corner, holds an additional Wolf wall oven (bringing the total to three), a Wolf microwave and a GE Monogram fridge-freezer combo. Beams are used for decorative effect in the ceiling of the kitchen, where there’s no shortage of workspace. The spacious mudroom provides ample storage, perimeter bench seating and a ceramic tiled dog shower in a sophisticated setting. Black-and-white files on the floor couple with white subway tiles on the wall to create a practical, yet beautiful space to clean up from the outdoors. Both pets and muddy boots enjoy a rinse with dog shower. 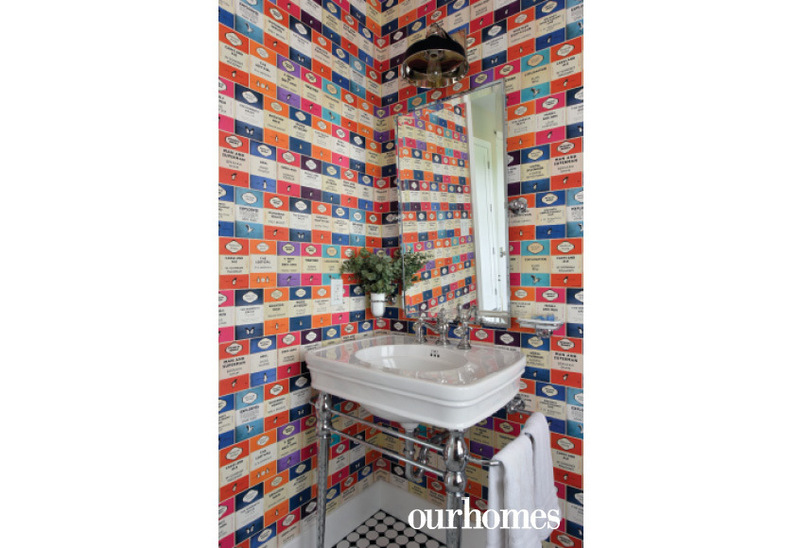 The Penguin Library wallpaper, by upmarket Osborne & Little, adds a quirky touch to the main floor powder room. Looking down over the great room, the second level leads off to two secondary bedrooms, as well as one of two master bedrooms with en suites found in the home. The natural element of this barn board wall creates calm in the upper level master bedroom. A claw-foot Roxborough tub by Victoria + Albert and a spacious step-in shower are located in the second floor master en suite. Black slate sits atop twin vanities. This large secondary bedroom contains its own en suite.